Six major seismic stratigraphic sequences in the Raggatt Basin on the southern Kerguelen Plateau overlie a basement complex of Cretaceous or greater age. The complex includes dipping reflectors which were apparently folded and eroded before the Raggatt Basin developed. 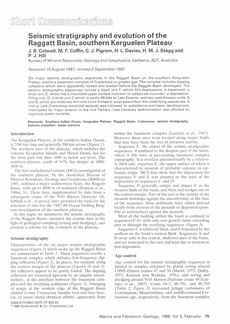 The seismic stratigraphic sequences include a basal unit F, which fills depressions in basement; a thick unit, E, which has a mounded upper surface (volcanic or carbonate mounds); a depression-filling unit, D; a thick unit C which is partly Middle to Late Eocene; and two post-Eocene units, A and B, which are relatively thin and more limited in areal extent than the underlying sequences. A mid or Late Cretaceous erosional episode was followed by subsidence and basin development, interrupted by major erosion in the mid Tertiary. Late Cenozoic sedimentation was affected by vigorous ocean currents.